I dont think the quality is even comparable. Am going to have to be a big spender on this one, since I am a fan of leather, and Frye's is awesome... But I am impressed with the f21! I would def go for the "real" deal on this...but the price...yikes! I like the Forever 21 boots. as long as they don't fall apart the F21 boots are a steal! HAPPY BIRTHDAY!!! <3 Hope your days is awesome! Wow, those are so similar, I LOVE those boots! As a Frye owner, I will say that the boots are made BEAUTIFULLY. However, for anything that I don't see myself wearing for a long period of time I would go with the faux. In this case, I'm not a huge harness person so I would go for the F21 version. 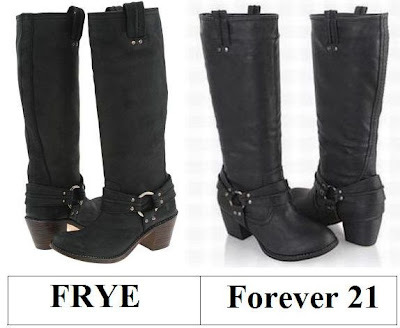 Now normally I would say Frye al the way, however Forever21 got it pretty darn close! I just got a pair of shoes form them that I am surprisingly really loving and I only paid $25!! can't beat it!! great find! i love my frye's but these are a good alternative for not spending alot. Happy birthday, E. I hope your day is so special. As for the boots, I love the F21 boots better. Love ya! Definetely Forever 21! They look both the same... Have a great day! Dont get me wrong, I love a deal, but I like my shoes to last and comfort is essential! Frye all the way! I was so excited to see this post, I have a lot of crazy memories wearing my various Frye boots! I love those kind of boots, so grunge but yet so feminine! And it's awesome how you were able to find boots what are almost 10 times cheaper. Wow! Btw, thanks for your lovely comment on my blog, I really appreciate it! and erika, thanks for the encouraging comment! i was having THE worst day yesterday. but all my blog friends have let me vent and have given me strength to just push on! thank you!! with boots i am very particular. i will need to try them on for size. $34 for boots? That is crazy! I love them! If I could only strut in them like Nina can...I think Forever 21 is the place for me. So similar, I'd go with Forever 21. It depends. If its something I see myself wearing over and over for many season I will splurge and buy the real deal. But if I think by next fall I won't be into the item I go with the cheaper version. You must know my obsession with boots by now. I love how the heel is a different colour on the FRYE ones. My last pair of black ankle boots looked just like that! I wouldn't wear them enough for that expensive price. I don't have to have Frye's. Forever 21 does it for me. I love your finds, it never ceases to amaze me how you find such clever knock-offs. This is a hard one though because I always think of boots as being a forever purchase, although they rarely last me more than a few years as I wear them to death...literally haha. I would probably go for the real thing but the price on the f21s is amazing! Hope you are enjoying the last few days before christmas!! I'm going to go big spender here. I really, really, really love Frye boots...really! The ones you picked out here are hot! Amazing look and price. It would be a bargain in my book. & I'm sure there is a Forever 21 nearby to check these out at. So cool. Especially, at Forever 21! well they definitely look similar! i am always i fan of the expensive over the cheap, but my price range could probably only handle the F21 boots! I don't own a pair of Fryes but I've heard good things so I'd go with those! My wallet is going to have to go with the F21 ones this time! I love you for finding a cheaper Frye look! Those Forever 21 ones are fabulous! I don't know how you always manage to find a budget piece for the designer label piece!! You are savvy. I have to say though - I would buy neither as this is not my style. Even though I would never spend that much money on shoes, I love the Frye ones. They look so supple, and expensive. But, Forever 21 still continues to amaze me, those boots are a perfect match. You always find the best stuff! of course i love how you find these things! and thanks for saving us money! what a lovely boot !! I am drooling over that pair of Frye boots. They are amazing! I'll have to splurge this time! forever 21 has stolen my heart with these! Though I love a good bargain, I'm totally a Frye girl at heart!